Classic Review: I Want to Go Home! I just wrote about re-reading books on Friday, so it seems appropriate to highlight again the book I’ve re-read more than any other. When I wrote this review, I guessed I’d read it fifteen times, but I think that’s a conservative estimate. Why so many times? It still makes me laugh! I’m a big believer in re-reading books, and I don’t think there’s any book I’ve read more times than I Want To Go Home by Gordon Korman. My guess is I’ve read it fifteen times–I lost count at twelve. Most of those times were also before the age of twelve, but I’ve reread it in recent years too, and even after all those times, it still makes me laugh. 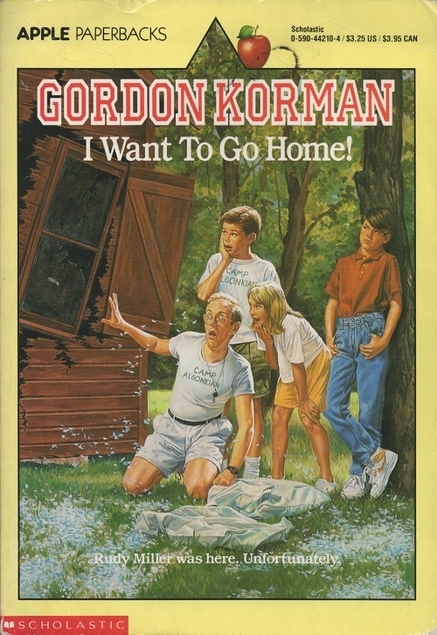 I’ve reviewed some of Korman’s other books, about the deep metaphor of a garbage bag and a hilarious series about a boys school. This one is another of his best. This is a story about a summer camp for boys, held on Algonkian Island. The story centers on Rudy Miller, who hates camp. He’s a loner, perpetually bored, and has no interest in participating in the many sports played at camp. His only interest is escaping–which, when you’re on an island, requires considerable planning. Rudy does become friends with Mike Webster, a comparatively normal boy who doesn’t enjoy camp either. Rudy has a dry wit, and is creative and intelligent–mostly using those skills to think up wild schemes for escape, dragging Mike along with him. As per his usual setup, Korman surrounds a relatively normal lead (meaning Mike, not Rudy) with crazy characters. To name just a few, there’s Mr. Warden, the bow-legged camp director who firmly believes that all boys love camp and never quite registers that Rudy may be a problem. There’s Chip, the counsellor for Rudy and Mike’s cabin; he’s constantly driven up the wall by Rudy, and has a tendency to fall into the lake. There’s Harold Greene, Rudy’s nemesis and a twit (Rudy’s dubbing). Rudy and Mike wind up in a whole series of adventures, involving stolen boats, a pillow fight that destroys a cabin, the startling discovery that Rudy is brilliant at any and all sports, and a good dozen escape attempts. Before the summer is over, Rudy comes very close to destroying Algonkian Island. It’s a great book. Simple, short, and the target age group is probably about ten years old. But it’s very, very fun even if you’re much older than that. If you want a quick read that will make you laugh, give it a go. I have–fifteen times. Buy it here: I Want to Go Home!